My birthday is on June 2nd. 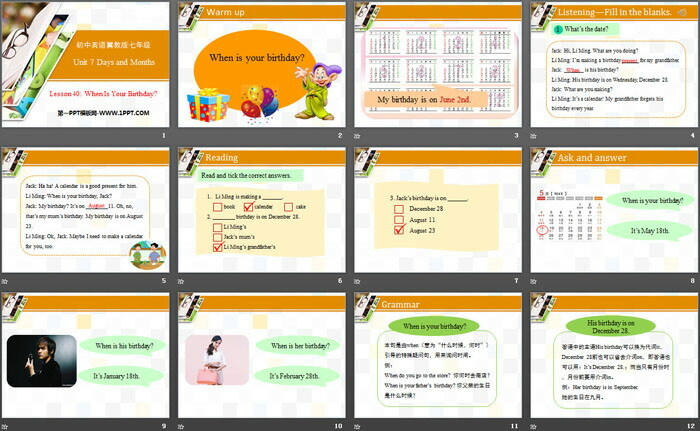 When Is Your Birthday?PPT，第二部分内容：Listening—Fill in the blanks. Jack: Hi, Li Ming. What are you doing? Li Ming: I’m making a birthday ______ for my grandfather. Jack: _______ is his birthday? Li Ming: His birthday is on Wednesday, December 28. Jack: What are you making? Li Ming: It’s a calendar! My grandfather forgets his birthday every year. Jack: Ha ha! A calendar is a good present for him. Li Ming: When is your birthday, Jack? Jack: My birthday? It’s on ________11. Oh, no, that’s my mum’s birthday. My birthday is on August 23. Li Ming: Ok, Jack. Maybe I need to make a calendar for you, too. 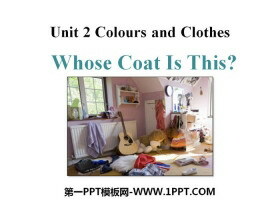 Read and tick the correct answers. 1. Li Ming is making a _______. 2. ________ birthday is on December 28. 3. Jack’s birthday is on ______. His birthday is on December 28. 例：Her birthday is in September. 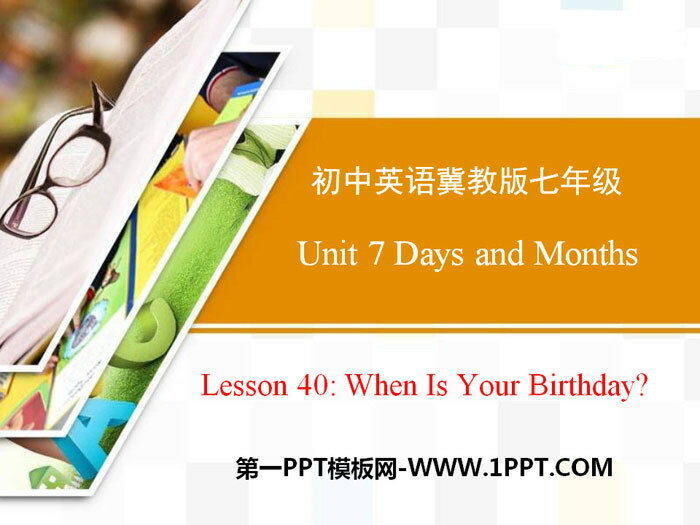 When Is Your Birthday?PPT，第五部分内容：Talk about the months. 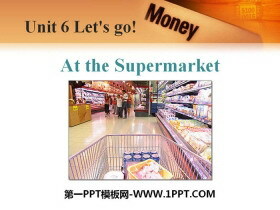 1.Spring Festival (春节) is in _______ or ________. 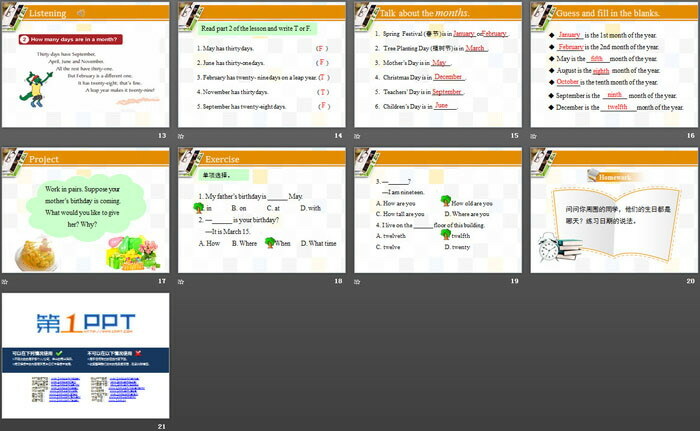 2.Tree Planting Day (植树节) is in _______. 3.Mother’s Day is in ______. 4.Christmas Day is in __________. 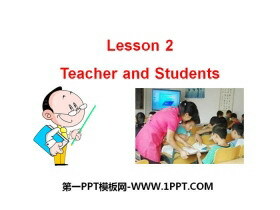 5.Teachers’ Day is in __________. 6.Children’s Day is in _______. Guess and fill in the blanks. ________ is the 1st month of the year. ________ is the 2nd month of the year. May is the _______month of the year. August is the _____ month of the year. _______is the tenth month of the year. September is the___________ month of the year. December is the ___________month of the year. 1. My father’s birthday is ______ May. 2. —______ is your birthday? 4. I live on the ______ floor of this building. 《When Is Your Birthday?》Days and Months PPT课件 第一部分内容：教材原文 1 A birthday present Jack:Hi, Li Ming.What are you doing? Li Ming:Im making a birthday present fo..
《A Class Calendar》Days and Months PPT课件下载 第一部分内容：词汇听写 同学们，上一课学习的单词你们都掌握了吗？现在大家来检验一下，点击下面的音频开始听写吧！ 课堂导入 Wha..